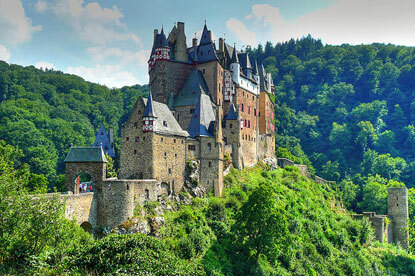 Burg Eltz is a well preserved medieval castle still inhabited by the family that built it in the 12th century. It used to feature on the German 500 Deutsche Mark banknotes. The castle is open daily from 9:30 am to 5:30 pm between 1st April and 1st November. Tours start every 10-15 minutes and last about 40 minutes. Tours are available in English, German, French and Dutch. Admission costs 8 € for adults and 5.5 € for students, children and disabled visitors.